I remember the feeling so well. Knee deep in 4 huge servings of pasta, followed up a family block of fruit & nut chocolate. Eating to the point of feeling so sick. Not wanting to FEEL anything. Just wanting to numb out. But then feeling DISGUSTING afterwards. The next day is spent fantasising (and googling) the latest diet and wanting the problem to just all go away (another avoidance strategy). Diet, binge (shame & guilt) then diet, binge and so it continues. Here are my reflections and lessons learnt from being caught up in the cycle for so many years (and then supporting women to break the cycle). Emotional eating is an avoidance strategy. When we are emotionally eating, we are not feeling. Dieting is an avoidance strategy. When we are food obsessed and meal planning, we are not feeling. When we are caught in the diet/binge or emotional eating cycle – we are just moving from one avoidance strategy to another. When we are caught up in this cycle, we have zero trust in our body and in ourselves. We are looking outside of ourselves for the answers and to be ‘fixed’. We just haven’t found that ‘fix’ but it’s out there, we just haven’t found it…yet. We often see dieting as the only way out of this situation. But using food to CONTROL our emotional eating is only short term (research supports this). We aren’t really living life. If we have issues with food and we aren’t managing them, it’s interfering with our life in a really unhelpful way. It’s like wearing distorted glasses with a negative view of ourselves interacting in the world. When we binge we see that we have done something ‘bad’, we then internalise this and believe that we are a bad person. This is the role that shame plays with our eating. We feel worse about ourselves and feel until we can manage our emotional eating (and lose weight) we will be unlovable. Our binge/emotional eating has NOTHING to do with food. Well it does, but it doesn’t. This is the BIGGEST lesson learnt. This is a big reason why dieting does not work. Food (and weight) are purely just the symptoms, if we are interested in healing our relationship with food, we need to go to the cause of what sent us to food the first place. Instead of focusing on WHAT you ate and beating yourself up about it. Try this instead. It will shift you from the victim mode (feeling helpless and hopeless and like a failure) to feeling more empowered (taking responsibility, learning from it and moving forward). 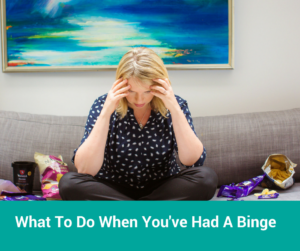 Here’s what to do when you have had a binge. I know it feels like the end of the world in the moment, but it really isn’t. It was a moment in time. That moment has now passed. But there’s some learning and feedback here for you. It’s time to offer ourselves some self compassion and understanding. Hating yourself at this point, makes you feel ten times worse (and will make you want to keep eating). All you did is use a familiar and efficient coping strategy to deal with some tough situations/feelings you were sitting with. It’s a moment of suffering that will pass. Reach out and get some support such as the Food Freedom Closed Community. Normalising our struggles takes the shame out of it. The more that you can reflect and learn from the experience, it will help you to move through it faster as well as start to heal your relationship with food. When you are in the right head space, start to unpack what took you to the food. What was the situation leading up to the binge? What feelings were you sitting with right before you ate? Was there anything I could have done leading up to this situation to manage my emotions more effectively? I often find that the feeling of powerlessness and having no control can be a huge trigger. If there were a silver lining from this experience, what would it be? We are trying to take the learning from the experience. Expect relapse, instead of expecting perfection. We all relapse. It’s all part of the change cycle and journey. Take the pressure off yourself and see it as a learning experience. What are some strategies that you can put in place to manage your uncomfortable feelings (without food)? Perhaps it’s trying some daily meditation or the 5 min body scan, maybe it’s expressing your feelings when required in a safe way, connecting with others or moving your body. Create some strategies that you can go to on a daily or weekly basis. Continue to tune into your body and your feelings, and allow them to be there. See your relationship with food a journey rather a destination. At every step there will be lessons and learning. You have a choice to see it as a learning or see it as a ‘failure’. 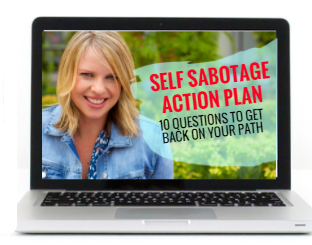 If you keep turning to food and you don’t know why, you might be interested in downloading my Self Sabotage Action Plan for only $29.